Boot Hill is the nickname for the common area at the "knee" in Leestone Street. It is right in front of you if you enter Leewood on Leestone Street, and could be thought of as being at the corner of Leestone Street and Leestone Street. When Leewood was first built, that area was not landscaped at all, and residents played volleyball there. Rumor is that there was a pro-active Grounds and Maintenance Committee (which at that point in our history included ARC also – they must have been busy!) who decided to plant numerous bushes and small trees there to encourage volleyball playing on one of the interior common areas. Thus, the nickname of "Boot Hill". As time went by, the more hearty trees grew to a nice height, and many of the "small forever" trees died. The area has been redesigned and planted and it no longer looks like such a name would apply. Living in back of that area was one of our founding members, Bob Meyer. He was the ultimate volunteer, and over the years was always there when Leewood needed an extra board member, a secretary, a newsletter editor, someone to clean out a hornets nest — whatever! When he died, the association honored his long time active commitment to Leewood by putting in a granite bench with a stone surround and a plaque. Bob had always wanted more benches in Leewood so that "in his old age he could sit down and rest" as he strolled the grounds wearing his Leewood baseball cap. We had a dedication ceremony, complete with a Leewood quiz on the history of Leewood, and a party afterwards. 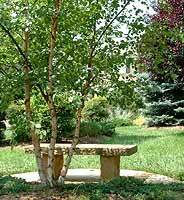 This bench is a great place to sit and contemplate nature or the plantings in that area which are colorful all year around. The airy lavender bushes there are called Russian Sage and bloom all summer in this area.